After the long, cold winter months, we’re relishing the arrival of warm, summer days and lighter evenings. As well as throwing open the windows, there are many ways you can welcome the summer season into your home, including the bathroom. From adding a few simple accessories that will temporarily lift your interior to picking permanent fixtures and fittings, follow our top tips for some inspiration! Buying a new bathroom is a big investment so you should pick pieces that will look just as fantastic in summer as they will in winter. 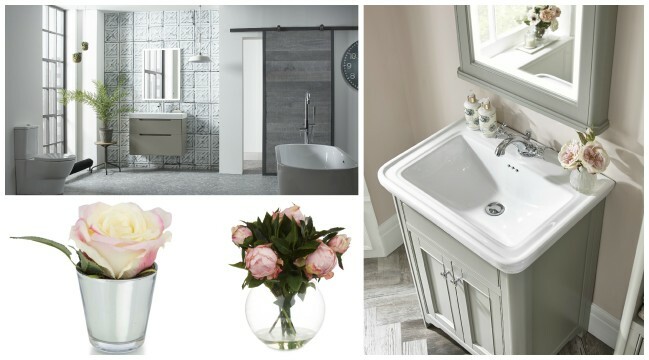 As well as being incredibly functional, all the products in the Laura Ashley Bathroom Collection are designed with this in mind so you can rest assured that whatever bath, shower, furniture or sanitaryware you choose, your bathroom will look stunning in every season! There’s nothing quite like stepping under a refreshing shower after a long, hot day at work or a sun-filled afternoon at the beach. Our traditionally styled Clifton shower system range will look beautiful in period properties and country-chic bathrooms alike. Finished in chrome, these showers have been designed with safety and comfort in mind and are thermostatically controlled so you won’t experience any bursts of scalding or freezing water should someone switch on a tap elsewhere in the house. If plumbing and logistics allow, position your freestanding bath in front of a window that looks out to your back garden so you can enjoy stunning views while you soak. Perfect for more modern bathrooms, our new, double ended Stretto bath has built-in thermal properties as it retains heat so you can enjoy taking a dip all year round. To enhance the summery look in your bathroom, swap heavier window coverings for lightweight or linen curtains during the warmer months. They will still protect your modesty and allow the sun to shine through too, instantly giving your bathroom a lighter look and feel. If your home doesn’t have an abundance of natural light, white washed floorboards can help to make your bathroom seem brighter and more airy, which is also important during the darker, winter months, too. Laura Ashley’s water-based Silver white paint is available for use in kitchens and bathrooms and could be used on walls as well. Bring the outdoors in literally and introduce some greenery to your bathroom. Lush ferns are perfect for a humid bathroom environment and will instantly bring a natural touch to your space. Freshly cut flowers from the garden, prettily arranged in a simple vase, work equally well, but if you’re not green-fingered, why not opt for some faux flowers, which will look lovely all year round? 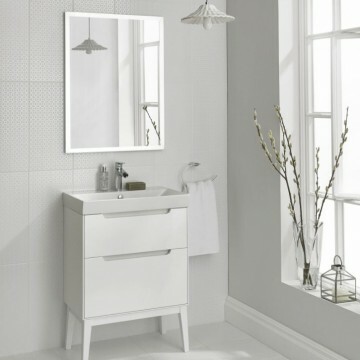 White remains one of the most popular colours to use in the bathroom and a clean, fresh, all-white colour scheme will make rooms of all sizes seem bigger and brighter while helping to create a calm, tranquil environment. As well as light clay, our Monograph basin unit comes in a gloss white finish, which will help to reflect light around your bathroom. With two sizes to choose from, it provides plenty of storage to help you keep your bathroom neat and clutter-free. Team it with a patterned, gloss white ceramic wall tile such as Marise, which will beautifully complement your Monograph basin unit.